My mind is wandering today. I have some news; my daughter is pregnant and I am going to be a grandmother. I would like to say I am thrilled for her but, since she told me, all I feel is no small amount of dread and worry. So I need to untangle these thoughts and feelings. Here goes. I am worried about her degree; she has a year left and a dissertation to write. I appreciate that it won’t necessarily be easy, being pregnant, but it will be so much harder once she has a baby. How will her pregnancy go? Will she be able to keep working? Will she be hit with morning sickness, and a sore back, and all the other things that can come with pregnancy? How will she manage? I am worried about her relationship. They’ve not been together long, they don’t know each other well… what if it all falls apart? I know how that feels, especially at 20 with hormones all over the place. What if he isn’t the boyfriend and father she wants him to be? What if he lets her down? Is she strong enough to pull herself back together? She is so far away from us too. 112 miles, to be exact. What about the days when she needs a shoulder, or a hand with cleaning, or just someone to reassure her that everything is okay? What about the times that all she needs is some time out from the little person she is charged with looking after? She’s a character, my girl. She likes to be in the very centre of everything. How will she adjust to being second in line, in the scheme of things? How will it make her feel, to have to always put another first? How is she really feeling right now? I remember being told I was pregnant with her, and being utterly terrified… Terrified because life as I knew it was over… Terrified that I would never be able to to this job justice, and it was going to be the most important job I ever did. And now I see what needs to happen, because that job is one that is never over. It doesn’t matter what I worry about; of course I will worry, she is still my baby, after all. What matters is that I can help her with her worries. I can remind her, on the days that she is worrying, that she is strong and beautiful and capable. I can remind her of the mountains we’ve climbed right to the very top. I can assure her that the worries she has are nothing next to the joys and the rewards of being a parent and that, yes, she will tear her hair out at times, but one look at the face of that child will make every tear and every frustration worth it. And, my beautiful girl, you will never be alone. Every second that you need me, I will have your back. I will laugh and cry with you… I will help you stand tall when you think you can’t, because I know what you are capable of, even if you don’t. I will hold your hand, and your child, and I will love you both so unconditionally. ‘Tis May, and this will be my first post of the month. I’ve been quiet, taking time with friends and the young ones, enjoying the sunshine while it lasts. I’ve been debating with myself too, going round in circles over ‘Angry Words’ and the people that inspired that post, and trying to work out how to deal with those feelings. The conclusion I have drawn is that my family are often the people who understand me least and that it is time to take a step back from them for a while. I love them dearly, but there are people who know me better who are more equipped to help me through. I feel better for having made this decision and my friends are here, as always, to share my smiles and laughs and that relaxed sensation I get from not feeling the need to justify myself constantly; thanks, people, you are wonderful. 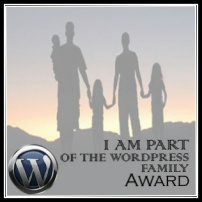 A little while ago, I was nominated for the ‘WordPress Family’ award by Kimberly at ‘Words4jp‘… Thank you Kimberly, I am honoured. There are few people I have met online that I have connected with in quite the same way as I have with you and, while I’m not feeling like now is the time to begin nominating others, I wanted to say a public thank you anyway 🙂 I’m looking forward to catching up on your posts! A film night with my children… such a good idea. My son wasn’t overly impressed with our choice of girly movie, but he sat with us anyway and laughed and sang. I don’t spend enough quality time with these children, and that must change. They are the biggest and by far the best part of my life, after all, and it does us all good.